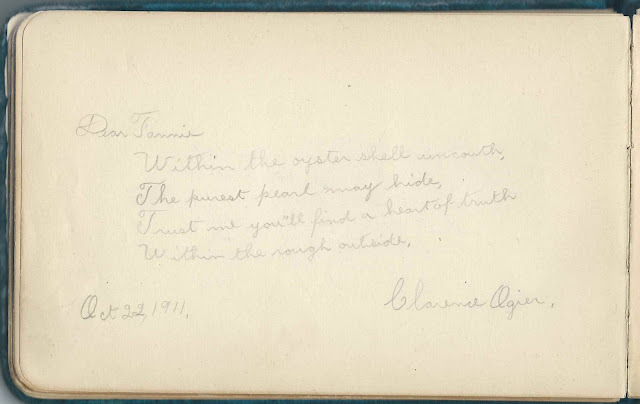 Autograph album with inscriptions from 1885 to 1911 that originally belonged to Vanette E. Ogier, "Vannie", of Camden, Maine, and then apparently passed on to her sister Frances Deborah Ogier, "Fannie", after Vannie's death in 1906. See another post that features an 1880s-1890s autograph album that Fannie herself kept; many of the people who inscribed pages in Vannie's album also inscribed pages in Fannie's. And Vannie herself, as Mrs. J. H. Heal, inscribed a page. Vannie's album measure approximately 8" by 6" and contains the sentiments of over 30 of her friends, including a page inscribed by her future husband James Henry Heal of Lincolnville, Maine, and another stamped with the name and address of J. H. Heal of Camden, Maine. Henry G. Smith of Boston, Massachusetts, who called her "Vannie" and "The belle of Camden Me." 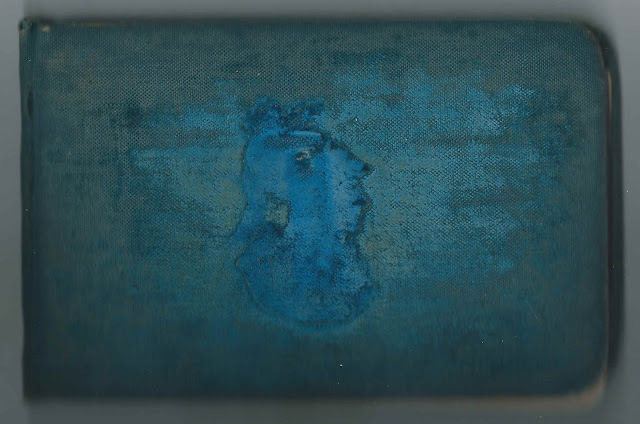 Clarence Ogier, who directed his inscription of 1911 to his aunt Fannie, who was apparently then in possession of the album. Fannie was Vannie's older sister. Vanetta E. Ogier, "Vannie" was born in 1870, the daughter of Samuel Emery Ogier and Martha Ann (Heal) Ogier. About 1889, according to the 1900 Census, Vannie married James Henry Heal, son of Henry Heal and Julia Ann (Dickey) Heal. They had two daughters, Grace Mina Heal and Helen A. Heal, before Vannie died in 1906. Vannie, James and his second wife Bertha (Green) are buried in the Mount View Cemetery at Camden, Maine. Grace inscribed a page in the album in 1907, after Vannie's death. Coleman ? K Keller Poleman ? 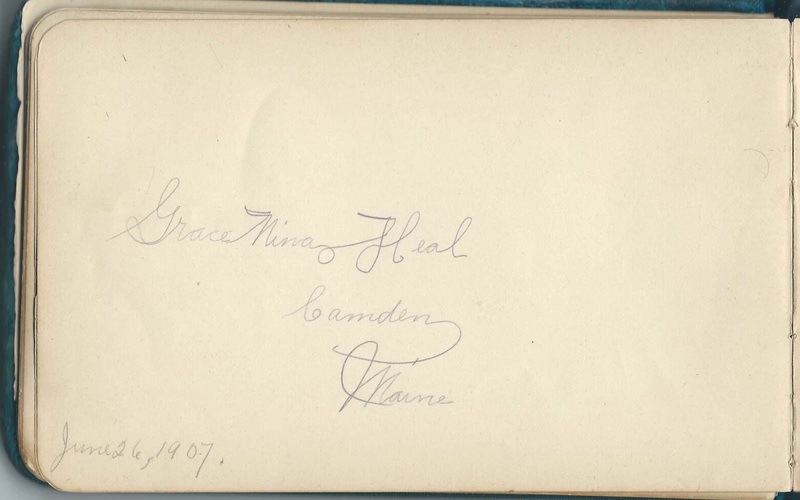 Grace Mina Heal of Camden, Maine; inscribed on June 26, 1906. She was Vannie's daughter, born about 1893. O Clarence Ogier; inscribed on October 22, 1911, to Fannie, who was Vannie's sister. Apparently the album passed to Fannie after Vannie's death in 1906. Clarence's father was Samuel Emery Ogier, Jr., brother of Vannie E. (Ogier) Heal and Frances Deborah Ogier, "Fannie". R A. Richmond of Camden, Maine; not sure of middle initial; could be F or T or ? 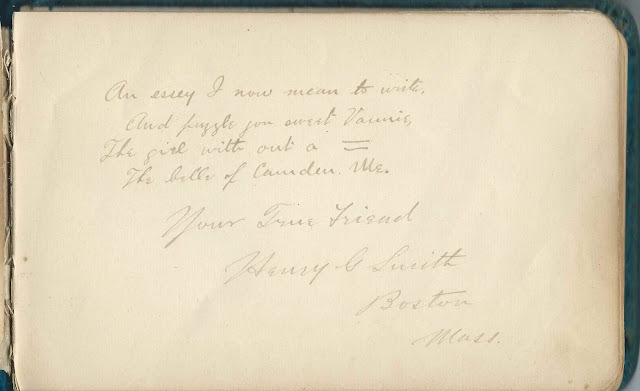 Henry G. Smith of Boston, Massachusetts, inscribed to "Vannie... The belle of Camden Me". Alice G. Stowe, inscribed at Washington on August 25, 1886, presumably Washington, Maine. W A. A. Waldron of Chelsea, Massachusetts [not sure of first initial], inscribed at Camp Canaan at Camden, Maine, on August 3, 1886. If A. A. Waldron, he might have been Albert A. Waldron.